WASHINGTON - Thousands of anti-abortion activists, including many young people bundled up against the cold weather gripping the nation's capital, gathered at a stage on the National Mall Friday for their annual march in the long-contentious debate over abortion. Although President Donald Trump addressed last year's rally in a video feed, Vice President Mike Pence carried the administration's message at this year's events, including expected remarks at a post-march dinner. Shapiro spent his time on a live show "debunking" abortion rights arguments. He discussed the value of life and empathized that his arguments were not based on religion but science. "Abortion is not just pulling a plug," Shapiro said. "Abortion is a violent act." 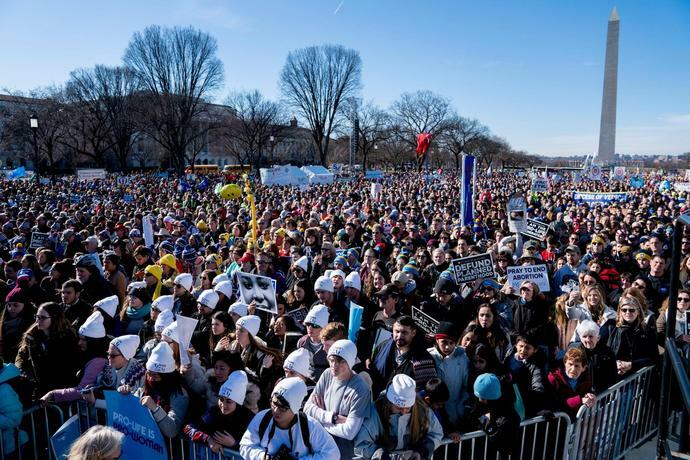 March for Life president Jeanne Mancini conceded that things in Washington have "changed quite a bit" over the last 12 months. "Last year we could lean in and expect people to be really courageous on the Hill on our issues and we had all sorts of champions," she said. "This year, we're in the place of fighting for the status quo." "We are systematically going to dismantle these restrictions on women's health care," Rep. Diana DeGette, D-Colo., co-leader of the Congressional Pro-Choice Caucus, said at a news conference Tuesday where one caucus member donned pink boxing gloves. "So here we go!" "I'm a Christian and I believe that all life matters, including those who are unborn," said Brianna Kress, 24, from outside Annapolis. Barry Wood, 67, and his wife Susan, 65, of Richmond, Virginia, were married the same year as the Roe v. Wade decision, which affirmed the constitutional right to access safe, legal abortion, and have been attending the march almost every year since it started.